The performance of gold in 2017 depends largely on whether the Trump's presidency will lead to lasting shift in the markets. What changes do we mean? Some analysts mention the reflation, others point out the ‘risk on' sentiment and the ‘great rotation' out of bonds and into stocks. Ray Dalio, the founder and chairman of Bridgewater, claims that the Trump's victory was a turning point ending the period characterized by increasing globalization, free trade, and global connectedness; relatively innocuous fiscal policies; sluggish GDP growth, low inflation, and falling bond yields. The new period is believed to be characterized more by decreasing globalization, free trade, and global connectedness; aggressively stimulative fiscal policies; increased economic growth, higher inflation, and rising bond yields. Indeed, the U.S. Treasury yields, stock prices and inflation expectations have increased since the U.S. presidential election, which may really signal that we had already made the secular low in bond prices and inflation. We do not argue with that. The million-dollar question is whether these changes will be permanent, or, in other words, whether the expectations of Trump's pro-growth policies are realistic. You see, the whole reasoning is based on three premises. First, the new president will inaugurate a heavy schedule of fiscal spending. Second, this fiscal stimulus will significantly contribute to the economic growth and force the Fed to accelerate its tightening cycle to prevent the economy from overheating. Third, the tax cuts and boosted government spending will lead to higher inflation and, thus, higher long-term interest rates. Fourth, Trump will trigger a new ‘Reagan revolution'. However, there are serious problems with these assumptions. First, Trump's proposals would take a lot of time and political negotiation to be implemented and it would take even more time to influence the U.S. corporations' profits. If they are introduced at all, because Republicans may actually not support higher fiscal deficits. Similarly, infrastructure projects have never been high on the Republican's agenda. Actually, Trump did not say anything about more government spending. Instead, he proposed tax incentives for private companies to invest in infrastructure. Second, assuming that the U.S. economy is close to full employment (as the Fed argues), the increased government spending (if it happens and if it is funded by direct or indirect money printing) may only increase inflation instead of accelerating real economic growth (by the way, government projects are often ineffective). Third, it is not clear how the mere redistribution of funds from the private sector to the government or vice versa should increase inflation. However, assuming that it will, the widely expected higher inflation would increase nominal interest rates, but not real interest rates, which are crucial for the gold market. Fourth, the macroeconomic situation is now completely different than under Reagan when interest rates and inflation were much higher, while the public debt was relatively low. 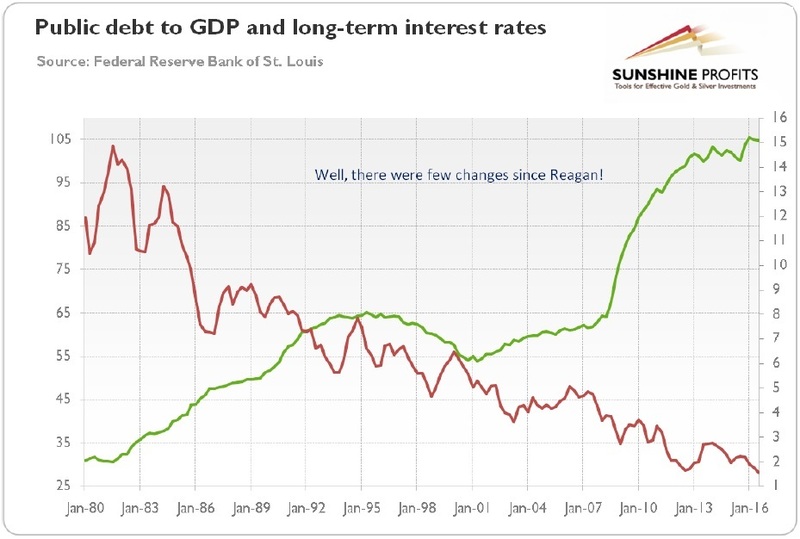 Therefore, Reagan had fiscal room to increase indebtedness and had a major tailwind in the form of potentially lower interest rates, in contrast to Trump who will face rising interest rates and an already high debt-to-GDP ratio, as one can see in the chart below. Chart 1: The U.S. public debt-to-GDP ratio (green line, left axis, in %) and the 10-year Treasury yield (red line, right axis, in %) from 1980 to 2016. Hence, it would be mad to expect that Reagan-like policies will lead to similar effects in a completely different macroeconomic environment. Actually, investors should be careful what they wish for, since after the Reagan victory the stock market initially reacted positively, but then had a reality check in 1981. The bottom line is that the prospects of gold in 2017 depend partially on broader market trends, asset reallocation, and investor sentiment. The stock market rally after Trump's victory led to the belief that we are entering into period of higher economic growth, real interest rates, and great rotation from bonds to stocks, which would be negative for the shiny metal. Although there might be some reflation, and asset reallocation might be justified, the current market excitement could simply be difficult to sustain, given the high stock market valuation, many unknowns about the Trump's policies, and different economic conditions than in the 1980s. As Benjamin Graham once said, in the short run, markets are a voting machine, but in the long run, they are a weighing machine, which implies that any longer-term trends must be supported by actual developments rather than mere expectations. Therefore, the outlook for gold in 2017 is not as bad as some analysts believe. To be clear, we do not call for a bull market in gold, but simply point out that investors may overestimate the potential for reflation under the Trump's presidency and the bearish perspective for gold. If you enjoyed the above analysis and would you like to know more about the most important factors influencing the price of gold, we invite you to read the January Market Overview report. If you're interested in the detailed price analysis and price projections with targets, we invite you to sign up for our Gold & Silver Trading Alerts. If you're not ready to subscribe at this time, we invite you to sign up for our gold newsletter and stay up-to-date with our latest free articles. It's free and you can unsubscribe anytime.